Are you ready to connect your brain to the cloud? In 15 years or so, futurists predict, your neocortex (which is the most developed of the cerebral tissues) could be connected directly to the global computing cloud. Human intelligence augmentation is at our doorstep, whether we are for it or not! If you are dubitative, please note that over the last 20 years or so, Kurzweil’s predictions have turned out to be correct a stunning 86% of the time. PS: Switzerland’s contribution in the field of virtual reality does not go unnoticed! Robert Redford séduit par une start-up genevoise. Building on the above feature article: a promising Swiss startup uses the cloud with the Avaa bracelet. The first bracelet that knows a woman’s cycle and precisely predicts her fertile days. In September 2015, this new Swiss invention made it to Techcrunch, a leading US new technology magazine. Renowned institutional investors and business angels invest USD 2.6 million in Ava. Investors include Swisscom and Zürcher Kantonalbank (ZKB). If you would like to have a baby, find out more here The Smart Evulation Tracker to help you get pregnant. Smart lens technology for diabetes patients (and how Google and Novartis make each other even wealthier). In January 2014, Google revealed that it has been working on a secret project. And a few months later it was announced that the Alcon eye care unit of Swiss pharmaceutical company Novartis will license the smart lens technology from the Google[x] research division. “The key goal behind the smart lens technology is to help people with diabetes. Currently, diabetes patients must prick their skin throughout the day to check their blood glucose levels, a task that can be time-consuming and painful. Google proposes a less invasive solution with its smart lens technology. This solution (still in development) would continuously track glucose levels by measuring the tear fluid in the eye. Those readings would then be sent wirelessly to the user via a mobile device. Get the details here Help people with Diabetics. Worrying is unuseful thinking about the future. For many of us, rapid technological development is unsettling. Combined with current global news of war and migration which drip into our psyche daily, we tend to get overwhelmed. It explains beautifully why worrying about the past and the future is a soul destroying affair. If you have 5 minutes spare, please watch this animated video. And if you want more, here is the link to The Power of Now. For the second consecutive year, NV LOG SA was the main partner of the CSI Logistics NV Talent Cup International Indoor Football Tournament, featuring the best clubs in Europe in the field of training. Present were legendary clubs such as Juventus Turin, Olympique Lyonnais, SL Benfica, CF Malaga, Ajax Amsterdam. Invited to measure themselves against these icons were Swiss teams (FC Basel, Grasshopper, FC St. Gallen, FC Sion, Lausanne Sports) and local clubs (Servette FC, FC Choulex, FC Donzelles, Olympique de Genève). For its fifth edition, the competition counted 24 teams, compared with 16 last year. Since its first edition, the indoor tournament has acquired the reputation of being the most challenging in Switzerland for the U11 categories. 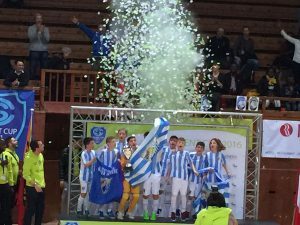 This year, CF Malaga won the final against Atlanta Bergamo, and this without losing any of its 11 matches of the weekend! CF Malaga succeeds Ajax Amsterdam who was the brilliant winner in 2015. Logistics NV is a committed senior partner until the next edition which will be held in February 2017. For the latest images and video, please check out the CSI Talent Cup’s Facebook page. Import LCL (Less then Container Load) Groupage. Australia – Burma – China – South Korea Indonesia Japan – Malaysia – New Zealand – Singapore – Sri Lanka – Thailand – Taiwan – Vietnam. Please go ahead and contact us for more information. Enjoying our “Living your best life” online magazine? Please give it a share, and we thank you kindly.